In our review of the masterful Uncharted 4: A Thief’s End, we surmised that the enduring success of developer Naughty Dog’s Uncharted series was due, in large part, to its endearing characters. Over the course of five entries (including Uncharted: Golden Abyss on PS Vita), we got to know lead characters Nathan Drake, Victor 'Sully' Sullivan and Elena Fisher, and embrace them as if they were family. We were there through the ups and downs, and were always relieved to see the trio make it out of any mess they happened to find themselves in. So what happens when you no longer have those characters to fall back on? With Drake’s story having received total closure at the culmination of A Thief’s End, Naughty Dog had the opportunity to continue the series by taking it into exciting new territory, both in terms of its setting and its protagonists. Enter Chloe Frazer and Nadine Ross, the former introduced in Uncharted 2: Among Thieves and the latter returning after her villainous stint in the most recent game – these are the heroines of Uncharted: The Lost Legacy. We recently sat down to play a section of the upcoming game alongside Naughty Dog’s Senior Communications Manager, Scott Lowe, who had some intriguing things to say about what we can expect from The Lost Legacy. Our demo kicks off in a huge area that aims to take the ‘wide-linear’ level design that featured in Uncharted 4 even further than before. Once again, you take control of a Jeep that lets you travel to different points on a map – the trick being that you have to navigate the vehicle around hills, canyons, bridges, creeks and waterfalls, making it an extension of the jumping, swinging and climbing gameplay that populates much of the rest of the game. As The Lost Legacy takes place entirely in India, the scenery is a lot more green and lush than the equivalent section of A Thief’s End, which saw you traversing around the desert plains of Madagascar. If you thought this was going to be small DLC expansion that you could knock over in a couple of hours, then you were mistaken – this particular level promises to be even bigger than the one in Uncharted 4. Our first objective is to drive to the only area marked on our map, in this instance, a large tower. Once we get to our destination, the only thing left to do, in true Uncharted fashion, is climb to the top. From here, we enter a circular room with doors all around. Pushing open each door reveals a new temple in the distance that Chloe marks on her map. Now that we have a map with multiple destinations on it, we can decide which one we want to head off to first – and the real fun can begin. Immediately, this open plan approach gives the game a much bigger feel than before. While not as open as the environments from the likes of the Far Cry series, this freedom to take on each temple in whichever order we see fit brings the game a grandness of scope we weren’t expecting from this spin-off – but this wasn’t always the case for The Lost Legacy. “Back in August of 2015, we announced the pre-orders for Uncharted 4 which also included the announcement that we would be doing our very first story DLC for Uncharted 4,” said Lowe of the The Lost Legacy’s inception. That extra work and attention certainly came across in our time with the game, which matched the quality of A Thief’s End in terms of writing, acting, visuals, scope, and of course, gameplay. As Chloe and Nadine hop back in their Jeep, ready to head off to their next destination, we start to get a sense of the pair’s dynamic, and how it differs from the likes of Drake and Sully in previous games. While those two have a kind of breezy rapport, the kind that can only come from being close friends for years, the relationship between The Lost Legacy’s leading ladies is only in its early stages. In a sense, they’re a bit like Joel and Ellie in The Last of Us – two characters thrust together because of circumstance, only just starting to trust each other with the details of their lives. Though she was an antagonist and a mercenary in Uncharted 4, Nadine entrusts Chloe with the information that she simply inherited the family business, in this case, the paramilitary organization known as Shoreline. Admittedly, the business involved war profiteering, but it’s at least slightly easier to understand where Nadine is coming from when you think of her as a daughter following in the footsteps of her deceased father. From our understanding, Chloe is the only playable character throughout the entire game, with Nadine acting as an A.I. helper during puzzles and gunfights. Speaking of gunfights, you will be getting into plenty of them, with our Jeep trips to each temple constantly impeded by mercenaries along the way. Like all of the Uncharted games following the second instalment, you can choose to approach each enemy-covered area using stealth tactics. You are still able to hide in long grass and tag enemies from a distance in The Lost Legacy, a mechanic introduced in Uncharted 4, which gives the game a slight Metal Gear Solid feel. And, if an enemy does get the drop on you, don’t be surprised to see Nadine run in and rip the guy from your back. As you might’ve expected, Uncharted: The Lost Legacy is a beautiful game, showing the kind of brilliant art direction and immense detail that we’ve come to expect from Naughty Dog. 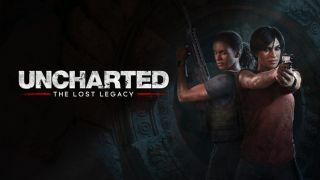 Speaking about how the game will take advantage of the additional power offered by the PS4 Pro, Lowe stated that Uncharted: The Lost Legacy will “have the same level of support we had for Uncharted 4, that includes increased resolution for 4K displays (in this case, a native res of 1440p at 30fps), higher fidelity on 1080p displays, super sampling, and of course, HDR,” which will also be available on the standard PS4. Uncharted: The Lost Legacy will launch in the US and UK on August 22, 2017 and in Australia on August 23, 2017.